Welcome to the penultimate stop on the Central Alberta Museum Tour of 2017 — Donalda, Alberta. Donalda represents the only real scheduling failure on the tour. 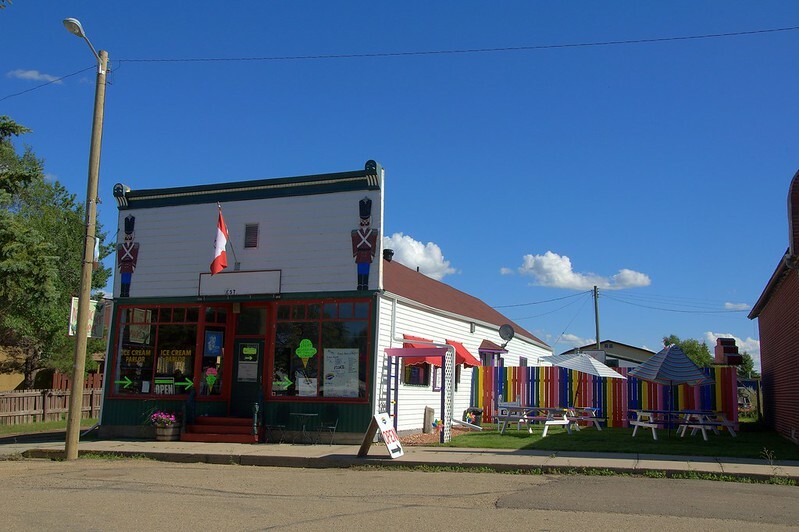 Originally planned to be our final stop, once we learned that the museum in Stettler was open until 17:30, we decided to add it to the agenda which meant we weren’t going to have time to tour the museum in Donalda. While I think it ended up being the right decision, it was unfortunate because the people at the Donalda & District Museum were probably the most responsive when it came to my emails. They even took the time to follow up with me several days before our visit to make sure we were still coming to see them. There are so many great museums to explore, I think when I start planning CAMT 2018 I will make sure Donalda is one of the first stops so we don’t miss them a second time. Now, nothing in Donalda catches the attention of travelers more than the “World’s Largest Lamp”. Standing 12.8m tall and 5.18m wide at the base1, the lamp certainly represents one of the more visually striking features of the town. Four local residents got together one evening in 1997 and were thinking of ways to draw attention to the collection of oil lamps housed in the museum and the idea for this lamp replica was born. Amazingly, they had it ready for its official opening just over three years later, on July 1, 2000 — that’s an incredible feat considering the amount of money they needed to raise in order to make it happen. You can walk into the base of the lamp; it is open when the museum is open. The area around the lamp is beautifully landscaped as well and it overlooks the Meeting Creek Coulee and offers some nice prairie views. If we had more time I would have put the drone up here. And, yes, the lamp apparently lights up each night. Don’t be fooled into thinking that the lamp is the only thing worth seeing in Donalda, however. 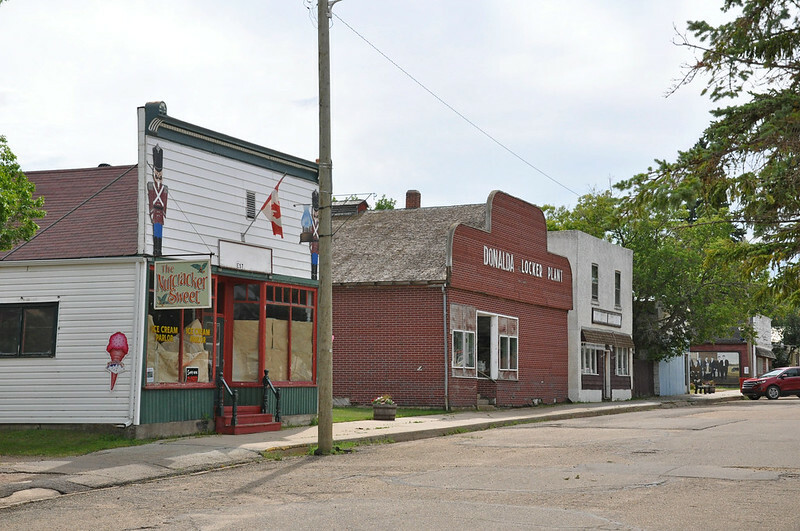 Donalda is a town that has a number of interesting buildings to check out as well, two of which are on the Alberta Register of Historic Places. Before getting to the buildings, however, you just know I had to stop and check out the 1950s-era fire truck sitting in the park along Railway Avenue. It’s in pretty good shape and looks as if all it needs are some new tires and it would be ready to roll. It would make a fantastic parade vehicle. Does anyone know if the museum is raising funds for a restoration or who actually owns it? It seems like such a waste to be sitting out exposed to the elements. 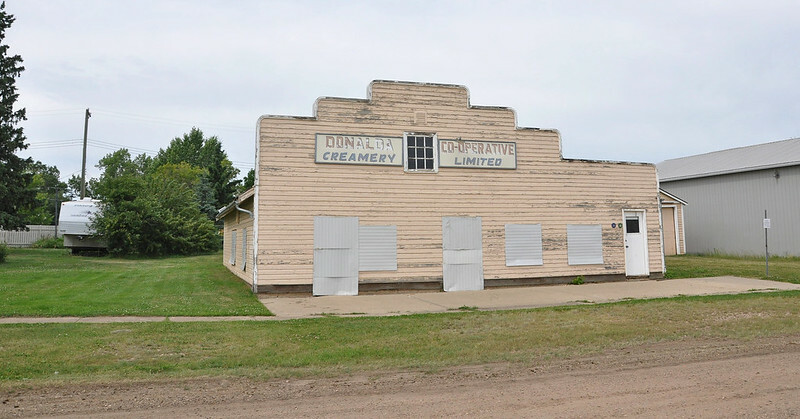 The other registered building in town is the 1955 Donalda Creamery. The exact origin of this building is a little obscure. In one version, a machine shop located across the street was purchased in 1954, moved to the present location, and then converted into a creamery.3 In the other version, a garage was moved from the Edberg – Ferintosh region to Donalda and them converted.4 Perhaps both are correct in their own way? Maybe the building was moved from the Ferintosh area in 1954, sat across the street for a year and then was moved to its final location. History tends to get pretty muddled sometimes and conflicting sources are not at all unusual when one starts lifting the covers on stories. Regardless, it is quite a building. A third historical building highlight is the train station. 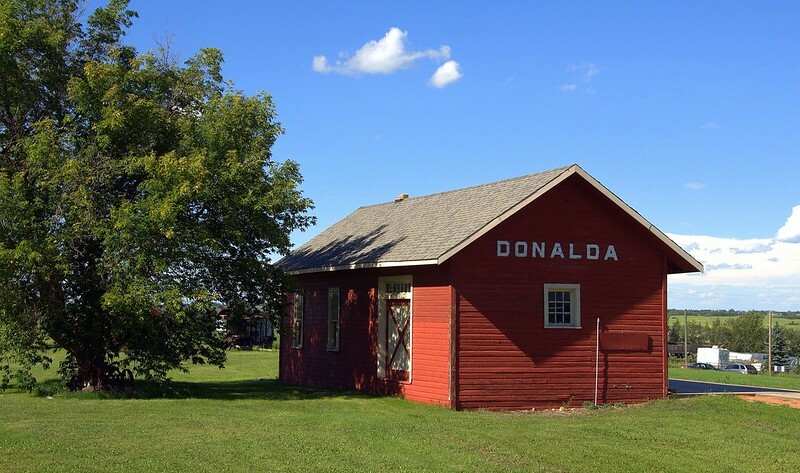 Donalda’s original station was not saved and this particular one was moved from Vandura, Saskatchewan. 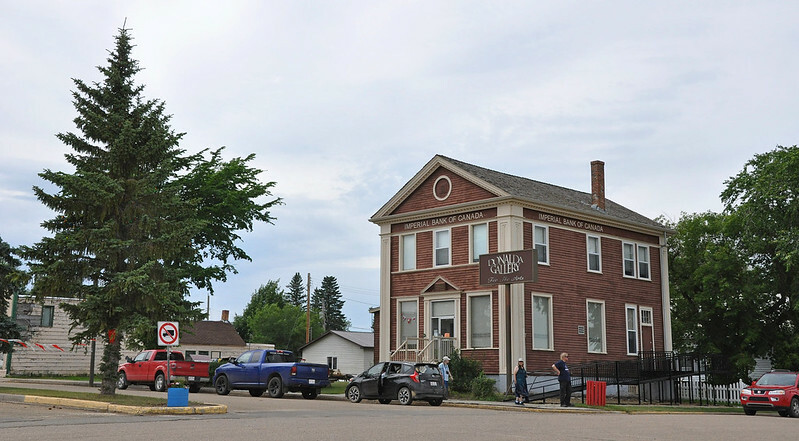 It is an example of a 4th Class station built by the Canadian Northern Railway4 and provides an interesting contrast when compared to the 3rd Class Station in Meeting Creek. And, finally, it was sad to see that the local ice cream shop, The Nutcracker Sweet, has gone out of business since my last visit in 2015. I certainly can’t say business was booming when I was last here, but it was nice to see a local business still making a go of it. Today the building it was housed in has been added to the other empty storefronts in Donalda. I have to say I am very impressed with the efforts of the local historical society in Donalda. Not only is there website (linked above) visually appealing and easy to navigate, it has a professional look and feel that many other small museums don’t match. Combined with the number of buildings they manage and the responsiveness of their email replies, they seem to be a thriving group, even if Donalda itself is facing some challenges. Give their Facebook page a Like too. 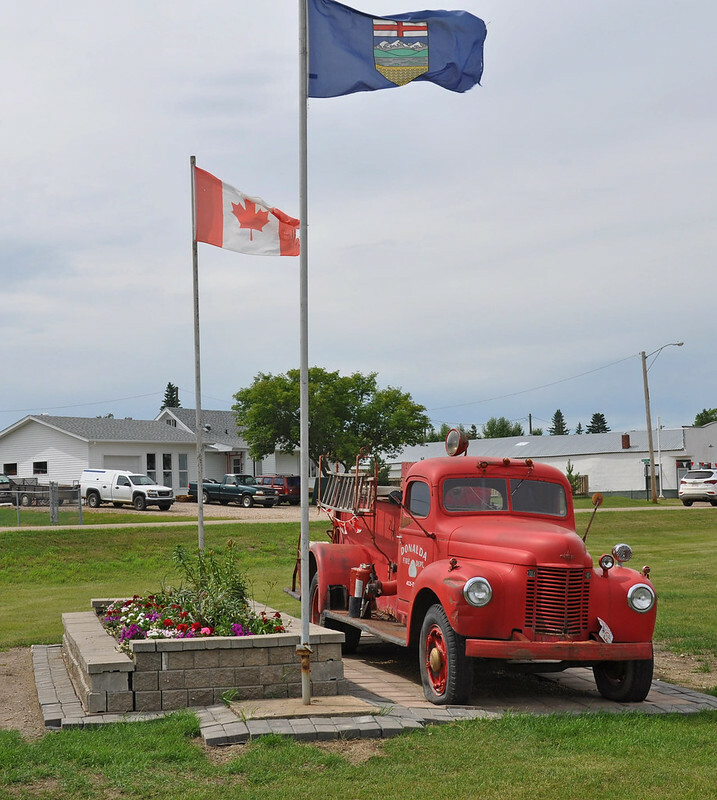 This entry was posted in Events, History, Travel and tagged Alberta, CAMT, Canada, Donalda, ExploreAlberta, fire apparatus, museums, World's Largest Lamp. Bookmark the permalink. Been following this series. Fantastic! So regret that Connie and I were not able to attend. Need two of me…I’m ready to be cloned!